Dietary potassium (K+) intake has antihypertensive effects, prevents strokes, and improves cardiovascular outcomes. The underlying mechanism for these beneficial effects of high K+ diets may include vasodilation, enhanced urine flow, reduced renal renin release, and negative sodium (Na+) balance. Indeed, several studies demonstrate that dietary K+ intake induces renal Na+ loss despite elevated plasma aldosterone. This review briefly highlights the epidemiological and experimental evidences for the effects of dietary K+ on arterial blood pressure. 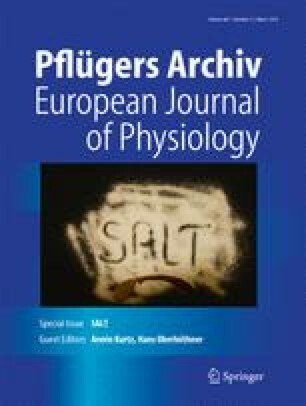 It discusses the pivotal role of the renal distal tubule for the regulation of urinary K+ and Na+ excretion and blood pressure and highlights that it depends on the coordinated interaction of different nephron portions, epithelial cell types, and various ion channels, transporters, and ATPases. Moreover, we discuss the relevance of aldosterone and aldosterone-independent factors in mediating the effects of an altered K+ intake on renal K+ and Na+ handling. Particular focus is given to findings suggesting that an aldosterone-independent downregulation of the thiazide-sensitive NaCl cotransporter significantly contributes to the natriuretic and antihypertensive effect of a K+-rich diet. Last but not least, we refer to the complex signaling pathways enabling the kidney to adapt its function to the homeostatic needs in response to an altered K+ intake. Future work will have to further address the underlying cellular and molecular mechanism and to elucidate, among others, how an altered dietary K+ intake is sensed and how this signal is transmitted to the different epithelial cells lining the distal tubule. The cited work of the authors was supported by a collaborative project grant from the Zurich Center for Integrative Human Physiology (ZIHP), by research funds from the Swiss National Centre for Competence in Research “Kidney.CH,” and by a project grant (310030_143929/1) from the Swiss National Science Foundation. David Penton is a postdoctoral fellow of the Marie-Curie Fellowship program within the European Community’s 7th framework program under the grant agreement no. 608847. No competing financial interests to declare.